Lately I’m reviewing a lot of old favorite books for this blog. This is because I just did the math, and in order to keep up with my writing/reviewing/ book club facilitation I apparently have to get to read a minimum of 12 – 14 books per month. It’s like the best grad school experience ever without the grades. Anyway, I’m concentrating on some old favorites for this blog. I live in California and yesterday it got up to 104 degrees, which means it’s the perfect time to re-read Polar Star, by Martin Cruz Smith. Smith is most famous for Gorky Park, a mystery set in Moscow during the Soviet Era. 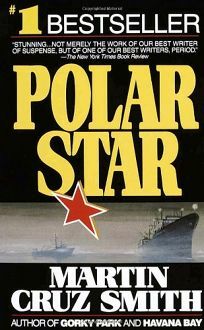 Gorky Park is a classic for good reason, but I’ve always preferred the sequel, Polar Star, more than it’s predecessor or any of the series that followed, because Polar Star so clearly etches the details of a stark environment into the mind of the reader. Due to the events of Gorky Park, our hero, Arkady Renko, is exiled to work on “the slime line” on The Polar Star, an arctic fishing vessel. Polar Star is not science fiction, but I suspect that many fans of science fiction will enjoy it, because the crew of the Polar Star lives in an environment so harsh that it might as will be the surface of the moon, and they are as isolated on their ship as any space crew. Of course someone dies, of course Renko is hell-bent on proving that it was murder and proving who did it, and of course this gets him in terrible trouble that involves his crewmates and the crew of an American vessel that is supposed to be working in partnership with the Soviet fishing fleet. The joy of this book is the incredible atmosphere. The book takes place on the Bering Sea during a time when it is always dark or twilight grey. A small section of the book takes place in Alaska, in Dutch Harbor. The character of Renko is so profoundly politically doomed that he’s functionally a ghost, and he’s obsessed with solving mysteries but he also knows that there will never be justice. Renko floats through his life the way the boat floats on the water, with no hope of improving his lot. Yet the actions of the plot give the book a forward momentum, and the sharpness of the images keeps the reader alert (watch out for a spectacularly disgusting autopsy). Because Renko has nothing to lose, he pushes forward on his investigation doggedly, with a wry sense of humor that is as dry as possible. Polar Star will either depress you or uplift you, depending on how you feel about dogged investigators who have been sentenced to gut fish and who solve crimes even though the crimes will not be punished or recognized. For some reason Renko, who is quite depressed, always cheers me up. I believe it’s his tenacity that does it. He claims to be deeply cynical, and he sounds deeply cynical, yet clearly he holds to some ferocious ideals, and he pursues them with no hope of a reward, just because. Also, it’s 104 degrees outside and in Renko’s world it’s very, very cold. And I miss living in Alaska. I didn’t live in Dutch Harbor but I lived on similar tundra and I remember the wind making the ground look like a wave, and the tiny flowers. Ultimately, Polar Star finds great beauty in bleak things. This entry was posted in Book Reviews and tagged mysteries, Polar Star.